If you’re an aquarium hobbyist who’s looking for some stunning fishes for your collection, then it’s time for you to know about Neon Tetra, a hardy fish with a dazzling appearance. Well, there can be a plethora of choice of fishes you would like to display, but you must go for the ones which involve convenient handling amidst your busy schedule. If you’re the type of person who looks towards the 360 degrees of life, then this article on Neon Tetra is a must read. Neon tetra is a popular aquarium fish which originates from Latin America. The scientific name of this fish is Paracheirodon innesi and it belongs to the family Characidae. They are popularly named as Neon fish or Neon tetra. An adult Neon Tetra hardly grows up to 4 centimeters in length. They are peaceful by nature and love to thrive in a shoal of minimum 15 fishes. Neon Tetra can live up to 5 years and loves to dwell in the bottom or middle strata of the fish tank. You should raise them in a tank that has a minimum of 10 gallons of water with a PH value of 7. While the temperature of the water should remain in between 68-79 degree Fahrenheit, the hardness must be 10 dGH. They are omnivorous in nature and tend to scatter eggs all over the place where they breed. The care they demand is of medium level, and that makes it quite an easy affair for any beginner hobbyist to handle. Research says that Neon Tetras primarily have their origin in Latin American waters. They thrive in the backwater and clear water streams of tributaries and distributaries of South American rivers. They were discovered way back in 1934 in the Amazon jungles by the French traveler August Rabault. However, they can also be found in the Amazon basins of South American countries like Peru, Columbia, and Brazil. You will mostly see them swim in the middle layers of the water and feed on small crustaceans and worms. Sources say that these fishes are also seen to inhabit in Paraguay River basins, Rio Taquari, and areas surrounding Brazil. They thrive on water bodies that have their flow primarily across the dense forest. Thus, they’re mostly exposed to very faint sunlight. Neon Tetras are a popular variety and a captive breeding species that are traded in Europe and also the Far East. However, they are actively traded in Singapore, Hong Kong, and Thailand. The number of fishes that are being imported to the United States might even cross 1.5 million. An interesting fact about Neon Tetra is that only 5 percent of the fishes bred for aquariums come from South America. You can find various types of these active bred fish. They could be long finned, goldenly strained or might be of semi-albino variety. There are even species of neon which has a diamond-like appearance and possesses metallic scales over the top of the body. How does the Neon Tetra look like? Every individual gets attracted by the dazzling appearance of the Neon fish. The blue tinges that originate from the head and ends in the adipose fins are the one that attracts fish lovers. Also, there is a presence of redfin that runs from the middle of the body straight to the caudal fin. They have a capacity to turn off the blue/red iridescent hue in order to keep away from the predators. In fact, they are totally transparent apart from the hues. Usually, the colors tend to fade when they’re found to be sick. They have a spindle-shaped body with rounded nose and eyes which actually extend up to the majority of their head. 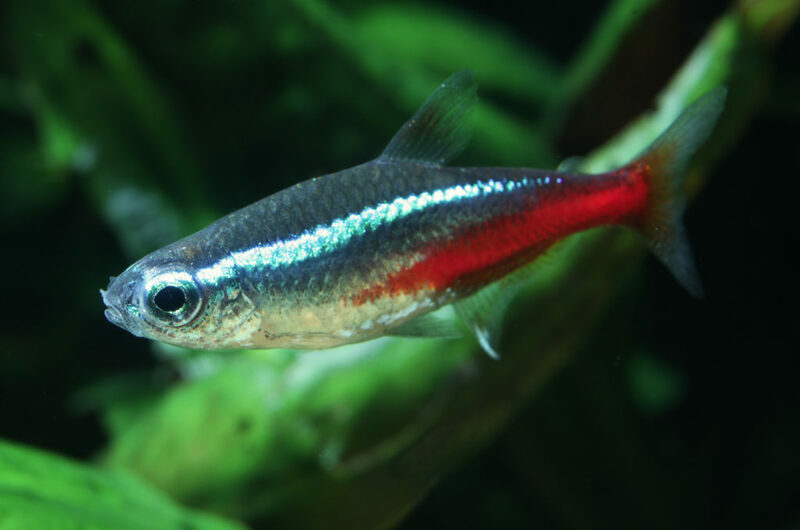 A healthy Neon Tetra grows typically up to 2.5 inches long, but its average length is 1.5 inches, though females have a comparatively shorter length than the males. Neon fishes generally have a slender torpedo-shaped body. The blue markings that run from the head to the tail make them very prominent in the backwaters. Below the blue stripes, there is a bright red stripe that runs till the tail. Because of these red and blue hues, the Neon Tetra tends to become one of the most attractive fishes once you keep them in the aquarium. Well, they have a similar breed, cardinal tetra, a variety that is often mistaken for the striking similarity they possess. Beginners in aquarium hobbyists beware of the differences between these two fishes. An easy way to distinguish them is that for neon tetra, the red stripe runs from the middle of the body till the tail whereas, for cardinal tetra, the same runs from the snout to the tail, that is the entire length of the fish. What type of habitat does a Neon Tetra thrive on? It’s a known fact that Neon Tetra originates from the Amazon basin and they are used to the low PH factor of water, low temperature, and dim sunlight. Well, it might not be possible to maintain a 100% similar environment, but you must ensure that a habitat identical to this is created. For adding an extra natural feel, you may add some Indian almond leaves and some driftwood in the fish tank. In case you’re looking for that dark outlook but want to avoid the tinted glass look, you may even consider adding plants like java fern that will give that wonderful look to your fish tank. It’s not necessary to place a large tank for keeping these tetras. In fact, Neon Tetras are a social type of fish, and you must not keep them alone, or they will feel unsecured. The best option is to keep them along with a shoal of 15 fishes. Note that if they’re kept in smaller shoals like 6, they may die out of stress. Moreover, they’re a colorful collection and look attractive when reared in groups. How do I set up a tank for Neon Tetra? It’s important to understand the fish and its habitat before trying to set up a tank for it. Please keep in mind that the earliest tetras used to thrive in the Amazon jungles with faint sunlight and leaves falling over the water bodies. • Selecting a fish tank is the greatest art: You may select a tank that can hold up to 15 gallons of water. Location of the tank is very important. A very cozy and dark corner of the room can be the best-suited location for placing the tank. You should see that there are minimum possible fluctuations in the water temperature and that chances of green algae growth are the minimum. Also, please ensure that the cabinet where you have decided to place the aquarium should be strong enough to bear the strength. • Setting up a system of filtration for the fish tank: You should set up an effective filtration system for your aquarium. There are various types of filtration categorized as mechanical, chemical and biological. Following the mechanical filtration is the easiest, and that involves removing particles from the water and keeping them clean. Biological filtration is difficult to set up and maintain, as it involves the breakdown of harmful waste products into ‘friendly bacteria.’ Elements like a sponge, sintered glass, and ceramic tubes contain bacteria which you must flush out. • Chemical process of filtration: Specially designed chemical absorptive substance is used to remove toxic substances from the water. You may use activated carbon to remove toxins, dyes, and medications from the water. Majority of the people who are fond of Neon Tetras generally use these three types of filtration. • Usage of under gravel filtration: You may replace the filtration system with gravels that settle to the lower substrate of the water tank. They function as mechanical as well as biological filtration media. The gravels allow the tetras larger surface area for swimming. You must occasionally clean the gravels and remove the excess debris. • Usage of sponge filter: You may use this method especially when the neon tetra is beginning to spawn. This is an air powered filter which allows the water to rise by drawing air bubbles to the tank. • Conditioning the water for the tetras to rest: After you have set up the tank, it’s very essential for the water to get conditioned. Tap water involves heavy chemicals like chlorine, copper, lead, and zinc. The tap water conditioner simply breaks down the chloramine bond and detoxifies the heavy metals. You may add blackwater expert to recreate conditions which are similar to that of Amazon basin. That way, the water will be loaded with natural humic and tannic acids that try to emulate water in natural tropical waters, similar to that created by peat, decaying vegetation and of course soils. • Controlling the temperature of the fish tank: If you can install air stones inside the tank, there will be a continuous supply of oxygen to the fish. You should maintain a water temperature that varies from 23 to 27 degree Celsius. Selecting the correct light source is also essential as it increases the temperature of the water. You may install UV light fluorescent tube instead of a simple fluorescent tube as it tends to enhance your pleasure of bringing out the vibrant colors of Neon Tetra. • Decorating your aquarium: The last step involved is, of course, decorating the aquarium. You must make sure that you have enough of green vegetation inside the fish tank. You may place green plants, branches, and roots inside the tank as Neon Tetras like them a lot. Besides, green vegetation will also give a natural look to the Neon Tetras. How do the Neon Tetras behave? Well, as said earlier, the Neon Tetras are social fishes. They like to thrive in areas where they can exist in groups of their own kinds. In fact, they are peaceful in nature, and it’s advisable that you keep them in community tanks preferably where they have only their kind or might be some other peace-loving fishes. With that said, never keep fishes that are much bigger in size as they can harm your loved Neon Tetras. Neon tetras are shoaling species, and they usually like to shoal where the group size ranges between 8 to15. Never keep a Neon Tetra alone in the tank with other community mates as smaller groups of Neon often found to be getting stressed, and they try hiding inside the aquariums. The good thing is you can spot the stressed Neon Tetra as they gradually faint color. Whenever you see a fish drawing to the bottom of the tank, you may conclude that the fish is either stressed or suffering from some diseases. You may consider removing the fish from the shoal. In fact, if they’re stressed for longer times, they may even lose their immunity. You may observe that the Neon Tetras behave more sporadically when they’re kept in appropriate shoal sizes. Neon Tetras very active species and generally dwell in the middle and lower sections of the tank. How long does the Neon Tetras live? The Neon Tetras generally live till 5 years on an average. But if you can care for them, they can even live up to ten years in healthy conditions. But that depends a lot on how you maintain good and livable conditions for them. What does the Neon Tetra feed upon? We know that Neon Tetras are omnivorous in nature. So, you may feed them on high-quality flakes, brine shrimp, frozen, dried bloodworms, or maybe some micro pellet food. They will require a wide range of food to remain healthy. Thus, you should concentrate on flakes or pellets which are of high quality. You may also consider giving them regular feeds of daphnia or brine shrimps. While feeding them, you must notice if they’re throwing a smaller amount of foods into the fish tank. If yes, reduce the amount of food the next time. You must see that they eat the entire amount of food given and nothing goes waste. You may feed them at night after your day’s work but note that feeding them 2-3 times a day is allowed. While in the wild, Neon Tetras are considered foragers and they prefer opportunistic eating. When they’re fed multiple times, they actually love their natural feeding behavior. Luckily they’re not fussy eaters, and you may find them eating algae, insects, and larvae from minute invertebrates. Consider giving them food based on vegetables, and for that, you can take ideas on veggie feed. Note that it’s trivial how many times you feed them in a day, but what is more important is that they eat all the food given to them within three minutes. Remember, voluminous food may bring fatal results. What should not be fed to the Neon Tetras? Since Neon Tetras are smaller species, you must avoid giving them bigger chunks of vegetables or worms. In fact, bigger chunks can choke their gullet and guts as their tummy is around the size of a pinhead. How can Neon tetras be bred? According to Neon Tetra experts, they’re one of the most recognizable and popular aquarium fishes in the world. Neon Tetras are very comfortable with cardinal ones. To create a suitable breeding environment, take a 24 inches long tank and fill it with rainwater. Stuff it with leaf litter and java moss along with Indian fern. Let the tank remain at a PH of 5.5, temperature 24 degree Celsius and DH of lesser than 1 and then leave the fishes dance at dim light. You will be amazed when you see the red and blue stripes flash against the dim yellow light. Within a couple of weeks, you will find the fishes spawn. Generally, Neon Tetras breed when they’re about 12 weeks old. However, for better results, you may remove the adults from the tank and let them breed separately. Within a couple of weeks, you will see baby Neon Tetras coming out and gradually they will begin to show their characteristic color. How to go traditional while breeding Neon tetras? You may try the traditional method of breeding Neon Tetras within 12 by 8 by 8 tanks. They come with a natural layer of java moss and fresh rainwater. Well, you may even consider darkening the tank a bit so that the Neon couples get a bit cozier. Maybe after 5-7 days, the fishes will be seen to spawn. Fries will be seen coming in some time. To make that happen, do maintain the temperature at 26 degree Celsius, PH lesser than 5 and DH lower than 1. If the tannin stains, the water becomes darker. You may remove the fry just after 14 days. But make sure that you remove the fries from the tank else they will be gulped by the adult ones. How do the Neon fries grow older? When the fries appear, they’re basically colorless. Some eggs do experience delayed hatching while some hatch earlier. Some baby Neon Tetras grow faster while the other remains hidden inside leaves. Well, the best solution is to remove and separate the grown-up Neon Tetras from those that are still un-hatched. You may observe that inside the same tank, fries grow up to a height when they’re capable of breeding while others don’t. How do I care for Neon Tetras? If you’re a first timer hobbyist, then you must maintain certain aquarium conditions for the Neon Tetras. • Try maintaining ideal tank conditions: As said earlier, it’s essential that you buy a large aquarium that can hold at least 10 gallons of water. Well, this is ideal for at least 24 fishes to swim and thrive easily. • Cycle your tank by removing fishes: You must undertake certain tests before you release your tetras. Go for a testing kit and remove any harmful bacteria that can kill your beautiful Neon Tetra. Make a note on an everyday basis to test when the NH 3 is broken down to NO 2. After that, compensate with NH3 as soon as NO2 breaks down. This way, you should continue the cycling of water. • Try to cover the filter intake: When you set your filter, try covering it with a mesh or foam, or it might take away your fish. While the procedure will protect the fish, it will also safeguard from potential bacterial growth. • Try adding organic matters: While the Neon Tetras remain in the wild, the water used to contain organic matters. So, you may add plants and drifts so that it takes the form of natural habitat. • Always monitor the PH factor: Generally, tetras thrive at water conditions where the PH factor is 5.5 to 6.8 that are slightly acidic in nature. Try testing the PH factor of water with a strip. In case you want to make it ideal for breeding, then let the PH factor be between 5.0 and 6.0. • Insert peat bags for lowering the PH of the water: In case you want to reduce the PH of the water, introduce peat bags that will help to soften the water making the environment suitable for Neon’s survival. • Try to dim the lighting: Since Neon Tetras better thrive in the dark, try to dim the light of the aquarium. To do that, consider growing plants inside the aquarium so that it can maintain a relatively better environment for the Neon Tetras. • Controlling the temperature: Normally, try to keep the temperature of the tank at 21-27 degree Celsius. You may buy an adjustable aquarium thermometer to record the temperature of the fish tank. For breeding, the ideal temperature to be maintained should be around 24 degree Celsius. • Cleaning the tank regularly is necessary to make the surface free from algae. • Make sure that Neon Tetras are placed in a group of similar natured fish, else they can get stressed. What diseases Neon Tetras can get affected with? Neon Tetras can be affected with a disease that occurs from an organism called Pleistophora hyphessobryconis. It generally occurs once the fish consumes the dead parts of deceased particles and the spores enter their body. As the disease progresses, the cyst begins to develop inside the stomach, and the health of the fish starts deteriorating letting them turn into pale whitish color. There is possibly no remedy of this disease other than removing the infected fish from the tank. You can easily identify the infected fish as it starts getting restless and breaks from the group, and prefers isolation. Who can be the most convenient aquarium mates for Neon Tetra? The secret of keeping Neon Tetra in a community tank is that they should not be kept with aggressive fishes. The Neon Tetras get stressed and lose immunity. Ideal tank mates can be ground species who don’t disturb each other. Neon Tetra can stay peacefully with white cloud mountain minnow, harlequin rasbora, betta, guppies, glofish, and sometimes prawns. You may also consider African dwarf frog and other algae eating fishes. For best result, inmates of the tank should not disturb Neon Tetra and prefer to swim other sections of the tank. With that, we wrap up this exciting, detailed discussion about the Neon Tetra fish. We hope any first-time enthusiast in fish keeping will find this read useful and would definitely try keeping the wonderful, dazzling Neon Tetra in their aquarium.